The best months to catch a salmon in Canterbury are between January and March. You just need an inexpensive fishing licence. All the Canterbury salmon rivers and beaches are open to public access. Although salmon fishing is a highly competitive sport every angler starts out the season with equal opportunity. Success is very much about studying river flows, tides, and swell and sea conditions so you are fishing the highest probability water. Persistence is essential when it comes to salmon fishing. You just have to keep at it. Your next cast could be the one when you hook up! There can be wild fluctuations in the numbers of salmon returning to spawn from year to year. Such fluctuations have so far proved impossible to predict. However, it is interesting to note that perhaps as few as 100 Canterbury anglers catch as many salmon as all the other Canterbury anglers combined. Knowledge is more valuable than luck when it comes to salmon fishing. 1. Mountains to the Sea – Footage of the Fish & Game hatchery at Montrose above the gorge on the Rakaia River. Includes 60,000 salmon smolt being released from the hatchery. The eggs take around 9 weeks to hatch. The young salmon go to sea aged 7 to 10 months. Learn just how few will make it back to the river to spawn! 2. Salmon Rods and Reels – looking at the different types of salmon rods and reels including eggbeaters (fixed spools), free-spool river reels and rods to go with them. Learning to cast with free-spools and avoiding birds nests, salmon/surf rods and reels, monofilament line, and removing some of the brake blocks from your reel to increase casting distance. Learn which reels are the biggest sellers and why you should get one! 3. Salmon Lures, Spinners, Hooks and Hardware – Zed spinners, the different weights and colours, other types of salmon spoons including tear-drop models and the Kilwell Quicksilver. Ticers used for surf fishing including weight-forward models for extra casting distance. Colorado spoons, when and how to use them, rigging methods with lead weights, replacing treble hooks, applying prism tape, and sharpening a VMC treble hook. Learn which spinners are the most popular with anglers and which colours are the best for salmon. 4. Getting About on the River – Film footage of quad bikes, advice about quad bikes, using 4×4 trucks on loose stony beaches, tips for not getting stuck, film footage and tips on driving a Toyota Hilux on a shingle beach and making river crossings, plus jets boats and outboard jet boats. 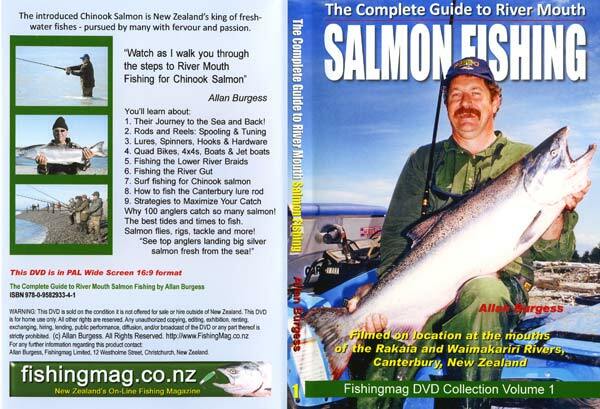 Short YouTube sample video of out-takes from “The Complete Guide to River Mouth Salmon Fishing.” This video was originally sold on DVD but is now available as a digital download only. 5. Fishing the Lower River Braids – Where on the river to focus your fishing efforts, water visibility, when to fish the lower braids, why its best to stay and one place in the lower river and let the salmon come to you! 6. Salmon Fishing the Gut – Tip on fishing this narrow fast flowing strip of water where the river meets the sea. The position of the gut and the river mouth are always changing as the power of the waves are in constant conflict with the flow of the river. 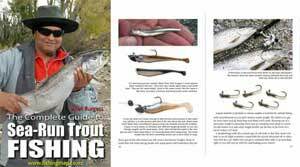 Learn about the best times, tides and methods for fishing the river gut. 7. Surf Fishing for Salmon – This is my all time favourite place to fish for salmon. Long rods and large capacity free-spool reels are needed to make the long-distance casts often needed to fish the surf. See some great footage of big fresh run silver Chinook salmon being landed in the surf at the mouth of the Rakaia River. Some very exciting fishing here! 8. Fishing the Canterbury Lure Rod – This local fishing innovation is unique to Canterbury. Lure rod fishing permits quick accurate casting in our often fast braided rivers. We take a closer look at the equipment and methods used to catch salmon, kahawai, and sea-run brown trout on this sort of tackle. 9. Strategies to Maximize You Catch – Includes some interesting figures on salmon returns to the Waimakariri and Rakaia Rivers. Just 100 salmon anglers may well catch as many salmon in Canterbury as all the other Canterbury salmon anglers combined. Success is more about knowledge than luck. 10. River Flows – Picking the best time to head out salmon fishing – when the conditions are just right is half the battle. Find out the river flow levels salmon anglers who fish the Rakaia and Waimakariri Rivers prefer the most. Extra Items – Includes how to tie a salmon lure. This is easy and saves you money. A look at Some of the most popular salmon and sea-run trout feathered lures, and the new distance casting Rocket ticer from Amazing baits.